Constangy, Brooks, Smith & Prophete, LLP is pleased to announce the opening of a new office in Century City, which expands the national labor and employment law firm’s footprint to 29 offices in 16 states. The new Century City office and the firm’s California practice will be led by Kenneth Sulzer, who joins Constangy from Proskauer Rose, LLP, where he was co-head of the firm’s California Employment Law Group. Sulzer will be joined by senior counsel Steven Katz, who comes to Constangy from Reed Smith, LLP. While the new office will represent employers in all areas of labor and employment law, it will have a heavy focus on class action defense, including not only wage and hour claims, but also systemic discrimination and other labor law violations. Sulzer, one of the top labor and employment law attorneys in California and nationally, specializes in complex class-action litigation and has represented and advised clients on a wide variety of matters, including labor-management relations, trade secrets and non-compete issues, discrimination litigation, U.S. Department of Labor investigations, and on issues involving employment tax, drug testing, employee privacy, sexual harassment law, and OSHA. 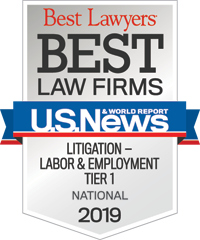 Sulzer has been recognized by Chambers USA, the Daily Journal’s Top 75 California Labor and Employment Lawyers, the Legal 500 United States, Best Lawyers in America and Southern California Super Lawyers. He is the immediate past president of the Federal Bar Association - Los Angeles chapter (and the first labor lawyer to hold that position), a fellow of the College of Labor and Employment Lawyers, and former chair of the labor law section of the Beverly Hills Bar Association. Sulzer received his J.D. from Harvard Law School. Steven Katz, who will help Sulzer grow the firm’s presence in California, specializes in complex employment litigation matters and class and collective actions, especially those involving wage-hour issues. He is a certified appellate specialist in California who has acted as counsel of record in more than 30 appellate cases in several venues, including both the California and U.S. Supreme Courts. Katz has also served on the clinical faculties at the UCLA School of Law and Stanford Law School. He received his J.D. from the University of Southern California and a J.S.M. from Stanford Law School.